I am a picture person. I used to love to draw and paint, still do if I ever get time. But what is in my head doesn’t translate as well as I’d like and other people always do it soooo much better than I can. So I am kind of in admiration of artists who do manage to achieve this so well. I have always enjoyed a good wander round an art gallery. Apart from the peaceful, almost reverential, feel of galleries, I find myself transfixed and mesmerised by what I see. I think I must have tried to duplicate this at home, as my walls used to be covered in pictures. I’ve learnt to reign this in (a bit) and have space around them now. But, for me, pictures are special things and, more often than not, there are special reasons for me having them. These are just a few of them – seriously, not room on one blog for them all! 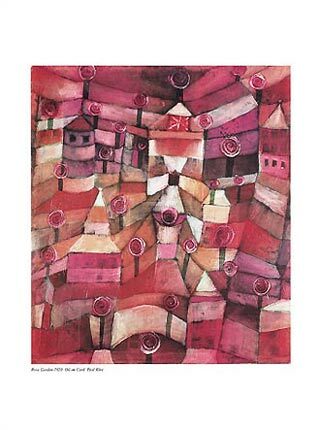 I have a huge print of this picture, Rose Garden, by Paul Klee, hanging above the settee in my living room. It was given to me as a gift when I left my job to move to Yorkshire, in search of a new life as a writer – I hoped. I was drawn to it because of the beautiful warm colours and geometric shapes, like houses tumbling into a bowl of summer fruits! In contrast, I fell in love with the simplicity of this picture, Sleeping Woman, one of Picasso’s many sleeping women pictures. I was going through a bit of a tough time, where I was sleeping really badly, when I found this picture in one of those choc-a-block full of housey things shops. I felt such a sense of hope and peace when I looked at it, that I bought it straight away. I have moved house three times since, but wherever I go, this picture comes with me and hangs on my bedroom wall. You’ll have to indulge me here, but this is… er-hum… one of mine… I know, just a tad self indulgent! But I hope you’ll excuse the lapse. I painted this two summers ago, when I was writing less and had a massive urge to paint again, something, as I said earlier, that I used to love to do. 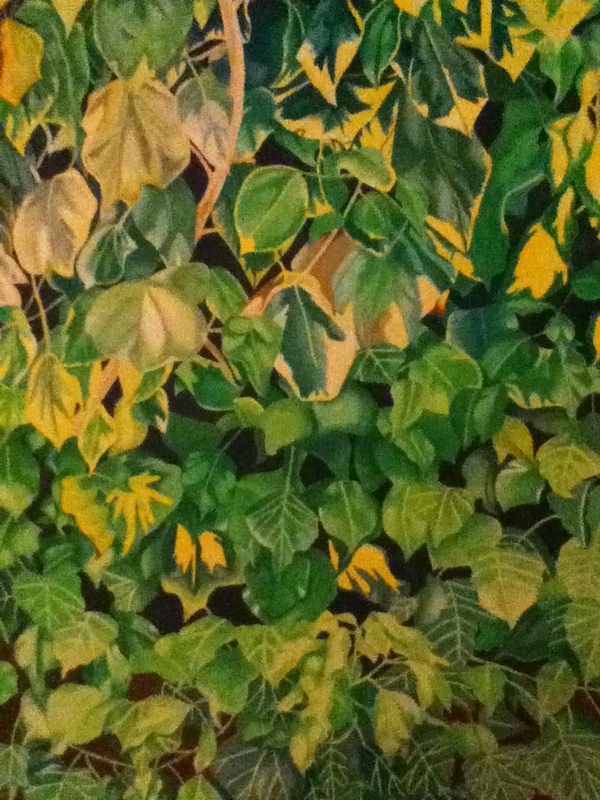 So, I bought a big canvas and a load of acrylic paints, took some photos of the ivy that covers our garage wall, and… da da!… well, not quite – it took 8 weeks for me to complete. There’s a lot of detail, not all of which you can see here. This now hangs in my hall and makes me smile every time I look at it because it reminds me how happy I was with brush in hand again after so long an absence. 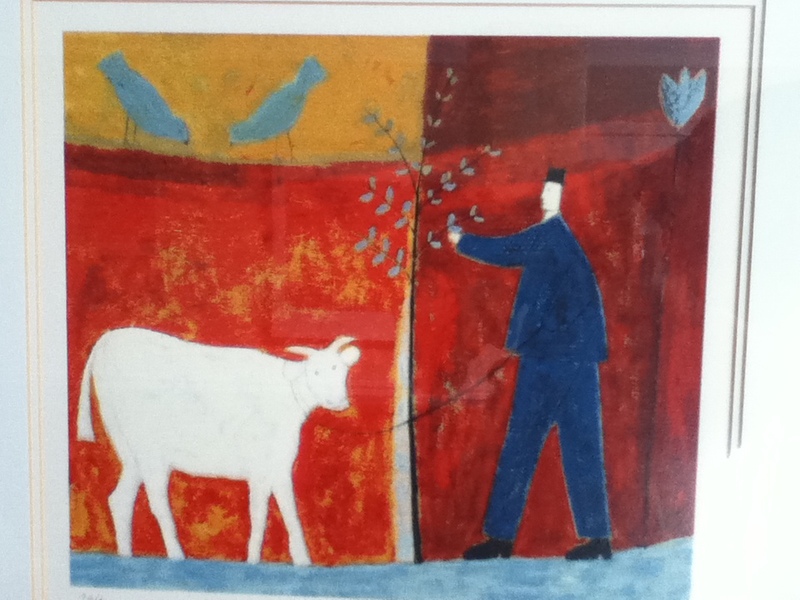 I bought this limited edition print, White Cow, 16 years ago, and paid more for it than I’d ever paid for a picture. It’s by Annora Spence, whose work I really like. Her paintings often appeared on cards, which I would regularly buy. I adore her use of colour (which doesn’t convey as well as I’d like on this photo) and the simplicity of her designs, as well as the abstract representations of nature. This hangs right above my mantlepiece and can be seen from every part of the room, which is as it should be. Do you have a favourite painting or picture, that either hangs in your home, or that symbolises something for you? I have an old Victorian picture, found in my grandmother’s spare room when she died. It is of an old gentleman, smugly asleep, full-bellied and with an empty glass on the table beside him. He is, apparently, a great-uncle of some kind – there is something almost debauched about him, but he looks so pleased with himself. No idea why – so I make that up! Thought the ivy was a photograph. Clever girl! Love ivy. Had some freshly brought by Scottish relatives to adorn my wedding cake; that’s how much I like it. A tree on top of my cake might have been a bit too much. I love how each of your pictures tell a story, which is what I think personal art is all about – the personal link behind each one. Another diverse collection, Abi! I don’t have a favourite artist but will wander round a gallery and a subject matter will blow me away. Like The Glass by Vermeer at London exhibition. Didn’t get drawn to anything else but something about that glass just grabbed me. Bought one from the gift shop but it soon got smashed as is the way with china in our house. On my walls I have: artwork I painted as a 15yo; a simple one line sketch of me by Steve Niblock – a friend of my husband & aspiring Scottish artist; a watercolour print of Bolton Priory in Wharfedale, by Terry Logan – a local artist and made famous with his saucy W.I. calendar. This is special because I used to work as a PA at Johnson & Johnson in Gargrave & on their behalf commissed him to paint this picture as a special gift to the CEO. It was a favourite, local beauty spot of the Americans when they visited. I also have 3 large, bold Warner Bros prints of Tweety Pie, Sylvester and – my fav – a large, colourful Warholesque style rendition of the Tasmanian Devil by Steve Kaufman – a student of Warhol I think. And finally, original artwork from my naughty 3yo – of course! However, due to the sloping nature of my walls and the mud in between the panelling, we are limited as to what we can hang! Each of my pictures elicits a different emotional response from me. If I had loads of money and a large house I would go to town. How lovely to hear about all you pictures and paintings – they all sound so personal, which is how it should be I think. Glad you like the ivy painting – I enjoyed doing it so much. Ivy on a wedding cake sounds lovely. My wedding bouquet was cream and green orchids and ivy and was to die for! Beautiful! I am so envious of artists — and I include you in that (the ivy is gorgeous!) because unfortunately I am more a stick figure person, although I do love fabric art, and I dream of taking a painting class someday. Visiting galleries and especially art museums is my idea of a fabulous day! And Paul Klee’s Rose Garden is incredible (haven’t seen it before). Still, although I love artwork, I hang very little in our house because we are constantly under renovation, and it just feels too unfinished… I have a few landscapes on our dining room wall — pieces I’ve collected that remind me of people and places I’ve lived. Your painting of the ivy is absolutely stunning. I paint but can only do people. 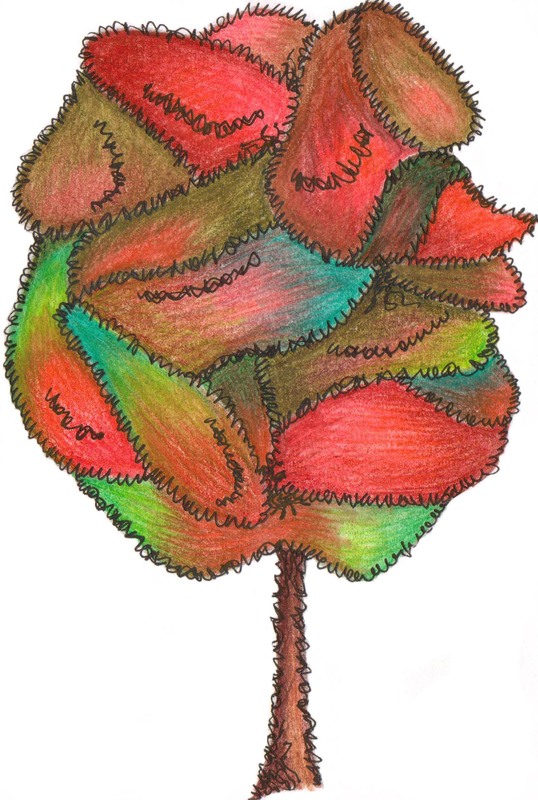 I find it so hard to do inanimate objects and plants/trees convincingly and I’m not really one for impressionism. My house is full of art. My fave is Tamara de Lempicka because I’m an art deco obsessive but I also have some lovely Japanese pen watercolour prints, some brilliant Beryl Cookes, some art nouveau stuff and my own gubbins. I rarely get to art galleries these days and have had 4 canvases waiting to be painted for over a year now. Writing takes up what creative time I have. Hi Marnie, so lovely to hear about your passion for art too and about your own painting. I haven’t heard of Tamara de Lempicka, so will Google her to find out more. I do like the art deco stuff though, and love Beryl Cooke’s paintings. Like you, writing takes a priority over painting, until I get to that stage where I just have to do it. Thanks so much for commenting. – a watercolour of one of my favourite pubs in Glasgow I used to live across the road from. – an abstract painting of a beach landscape by Rebecca Dover. – a framed photograph taken by my wife, of a sunset over Calton Hill in Edinburgh. They each inspire me in different ways just by being there and allowing me to stare without asking anything. The ivy is gorgeous, I thought it was a photo as well. Pictures really do paint a thousand words, they are so inspirational. Ah, thank you Nicola. Glad you like, and yes, they really do paint a thousand words don’t they – lovely way of putting it. Thanks for commenting. ‘I painted this two summers ago…’ she says, casually. Wow! It’s amazing, Abi. I paint too – or do mixed media pieces, whenever I need a break from writing. I have prints of Rodin’s Danseuses Cambodgienne on my bedroom walls and a huge abstract painting on my living room wall, but I don’t know the artist… If I had more money, I would definitely buy more art. Ah, thank you – you’re so kind. How lovely to hear that you paint too. I never do mixed media as I have no idea how to go about it, so I’m really impressed with that. I wasn’t familiar with the prints you mentioned by Rodin, but I have just looked at them Google – what beautiful, flowing paintings, and gorgeous colours. And yes – like you, I would love to buy more – sculptures too. Abi – your ivy picture is gorgeous (and I should know, having been lucky enough to see it in real life!). I have two favourite pictures. One is a watercolour of the view from Box Hill, which is near where I grew up, painted by my husband. It’s like having a little piece of home up there on the wall. The other is an oil painting by my grandfather, which is actually just a sketch in preparation for a bigger piece of work. It shows ships in Falmouth harbour, Cornwall, just across the water from where he and my grandmother used to live. Strangely enough, many years after this picture was painted, and long after my grandfather had passed away, I ended up returning to Falmouth to go to university, and the painting shows the first house I lived in there! Hi Abi, as above I thought the ivy was real; stunning. I’ve always wished I could paint (or play the violin) but not to be. Although next week I am trying a silly idea with charcoal on canvas, just something that’s been bugging me for ages now. We don’t have any pictures on our walls, did have some cheetahs and horses once though. Thank you Martin – glad you liked the ivy. It’s been lovely to get such a positive response to it. I hope your charcoal drawing goes well. It’s nice to dabble, even if you’re not sure how it’s going to go; one of the things I like about art is the freedom – very much like writing I think.